You can generally find Thai basil (Indonesian: daun kemangi) in most Asian groceries. You may think that Italian basil is a good substitute, but it actually is not. Asian dishes never use Italian basil. If you must substitute, it is preferable to use the same amount of cilantro. Yes, the dish will taste different, but I think cilantro matches better with the rest of the ingredients compared to Italian basil. Drain the tofu block really well, cut into 1" cubes, sprinkle with salt and pepper, lightly dusted with corn starch (or all purpose flour), and deep fried until light golden brown. Set aside to drain. Heat 2 tablespoon oil in a frying pan over medium high heat. Sauté shallot, garlic, bird eye chilies, and toasted shrimp paste until fragrant. About 3 minutes. Add tomato slices, salt, and sugar. Stir until tomato looks wilted and slightly saucy. 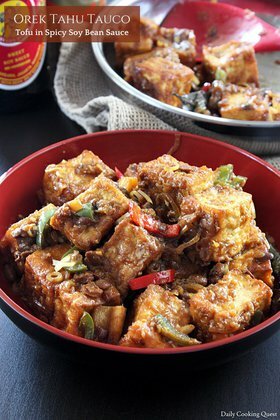 Return fried tofu cubes to frying pan, and stir in the sweet soy sauce. 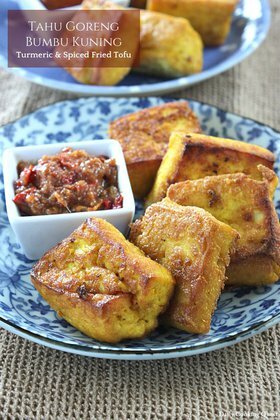 Gently toss until tofu cubes are coated in sauce. Finally, add Thai basil leaves, and stir until wilted. Turn off heat, and transfer to a serving plate. 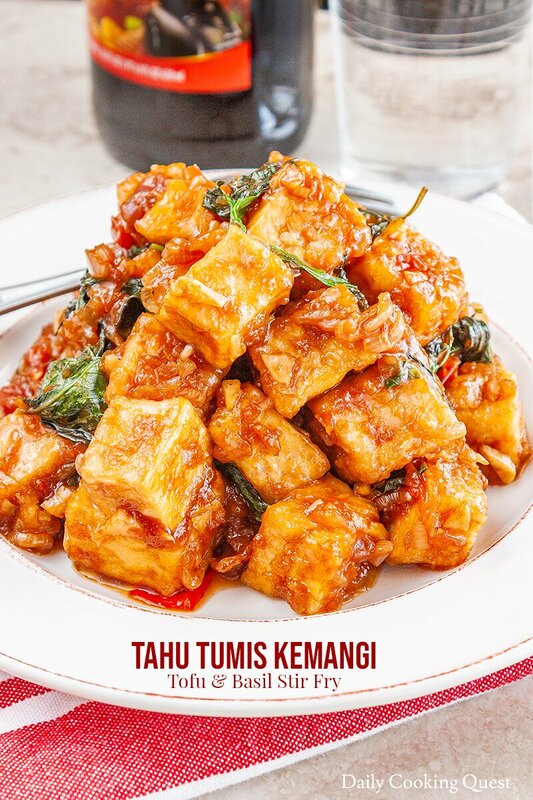 Serve with steamed white rice. (*) Or 1 teaspoon of Thai shrimp paste, or 1 tablespoon of fish sauce. Oh, this looks wonderful!!! So delicious and flavorful. 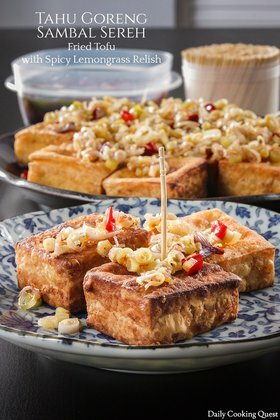 This is a wonderful recipe with tofu. I have previously tried Chinese &amp; Japanese recipes by online references. 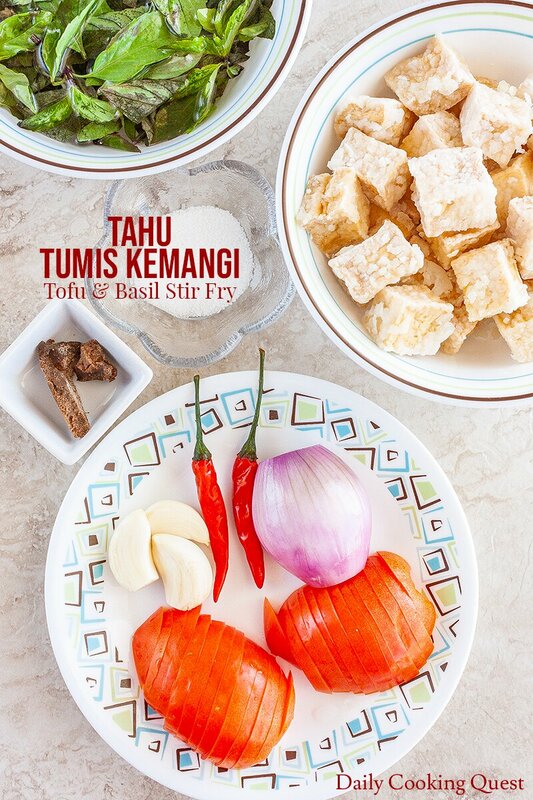 I’ll surely try this Indonesian recipe (Tahu Tumis Kemangi / Tofu &amp; Basil Stir Fry). Thanks for sharing it.